Before you start worrying about the colour of your walls or what pictures to hang, you need to make sure that you have permission to go ahead with your conversion, extension or new build. As the UK’s leading architectural practice for everyday homeowners, we’ve helped hundreds of people to understand their permitted development rights and navigate the planning application process. From finding an architect who designs your vision to receiving your application decision, here are a few of our most frequently asked questions. Architects are amazing (we know - we employ a few! ), but they can also be extremely expensive. If you’re planning a conversion or extension, there’s often a clear best-case scenario, so you might not need to pay someone to reinvent the wheel. More often than not, you just need someone to ask great questions, present you with some options and then draw up your plans. There’s also a myth that a small, local architect may be more engaged or involved with your project, but that isn’t necessarily true. Most houses in the UK share similarities based on the era in which they are built, so a firm that works nationally is potentially more likely to understand the best way to transform or add value to your home. We use technology and an innovative, interactive platform to make sure that we're fully engaged in your project, without charging you for any of the extras that come with physical visits or additional meetings, and we bring the collective knowledge of over 1000 successful schemes to every project we encounter. When you apply for either planning permission or a lawful development certificate, you need to submit both existing and proposed drawings. In the past, these would be produced by an architect visiting your home and measuring each room, equating to several billable hours. You could expect to spend £450 or more on this routine process. At Resi we can either map out your home using information you've got to hand, or by looking through your local authority's records on the area. And if sufficent data can't be gathered, we have an expert surveyors in house, who let us provide a measured survey at the fraction of the price of an independant service. 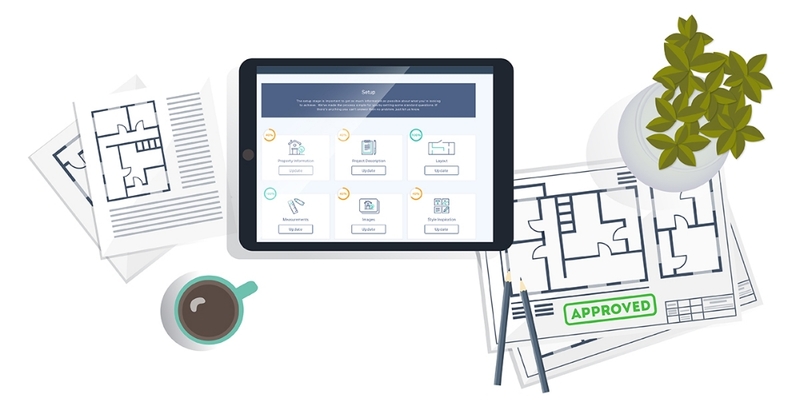 Our process means that you can even put together a set of plans for a property that you haven’t even purchased yet, helping you to understand the potential for your new home before you make a commitment. We also help clients sell their properties by demonstrating what potential it has and sometimes securing planning permission. This often results in a higher price and is very attractive to buyers. Where can I learn about planning regulations? As these things can be notoriously tricky, the best thing to do is book a free consultation with our experts. We’ll happily help you to understand if your project will qualify under your permitted development rights, or if you’ll need to submit a planning application. If you decide to explore your options further, we can produce all of the floor plans, elevations and 3D models that you need for either a planning application or a lawful development certificate application, and even submit everything to the council on your behalf, acting as your agent throughout the process. What do I need to submit as part of a planning application? If you select our Planning Package, we will prepare and submit a completed planning application to your local council on your behalf. If your project falls under permitted development, you will still need to have similar documentation in order to apply for a lawful development certificate, which will protect you when you come to sell. What do I do if my planning permission application is rejected? If you use a reliable architectural service - that has experience with residential design and planning - to properly research your local regulations, this is less likely to happen. Sometimes if your application is about to be rejected over a minor point, a nice planning officer might let you know in advance about the small changes that will push it through. If permission is denied outright, we can advise on next steps, and/or we recommend employing a planning consultant to manage your appeal. You can also re-apply, without paying a fee to the council. They offer a free resubmission service.